I stumbled upon this new writer, atlas brown, a couple of weeks ago via my friends literary blog. Her work is fascinating. The creative writer offered her first book of poetry, SOUL ALIVE! Poetry & Prose, on March 1, 2013 for FREE!! You know these days, people want you to buy their books and can’t even spell their names correctly. My bad, I’m just being truthful. However, there is something different going on in this literary camp. I wanted to read more of her work in general; the book was too short. Once, I heard about her second offering to the public, I immediately downloaded it tonight. I had to write about it. There are million things that I could have accomplished in the last 30 minutes. After downloading this story and reading it three times. I’m a fan for LIFE! 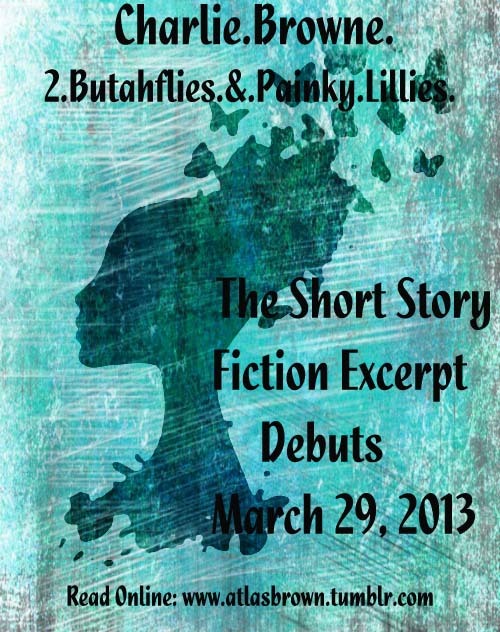 Charlie.Browne.2.Buthaflies.&.Painky.Lillies, is an experimental short-story turned novella. The writer decided to tease her audience by releasing an excerpt to ignite a literary craze. Trust me, it will work — the writer is that damn good! Charlie.Browne. is a young African American female dancer. She desperately wants to have a normal life, but doubts her own self-worth. A generational curse forces the girl to come to terms with the dysfunctional relationship that she has with her mother.